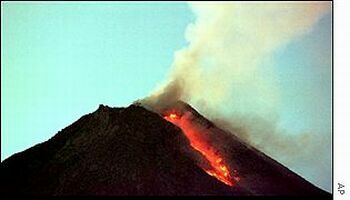 Mount Merapi does not seem to calm down with its fury. With the volcano rumbling ominously for weeks, the Indonesian authorities have ordered that thousands of residents who live on the volcano slopes are to be evacuated as a compulsory measure. The alert status has been raised to its highest level, as the 3,000m (9,700ft) peak can erupt imminently risking the densely populated Central Java province. In 1994, a gas cloud from the volcano’s last eruption killed 60 people. Subandrio, head of the Merapi section at the Centre for Volcanological Research and Technology Development, said, This morning we raised the status of Merapi to the top alert, which is the red code… Every resident has been ordered to evacuate. For weeks, there has been constant lava flow causing hot toxic gases. Climate Clues in Glass Sticks! ← Earth's magnetic field weakening! It will 'In 2000 years' intensify solar radiation with no field to deflect it!